So many things happening this spring. I’m close to wrapping up the first draft of Song of Borrowed Souls. You aren’t going to believe how twisted this story has become. I can’t wait to share it with you. Are you going to RT in Atlanta in May? I hope to see you there! Visit the RT Convention website for ticket and complete info. In collaboration with my PA, we’ve created the a trailer for the Good Doctor Series. Enjoy! Click here to view the trailer. 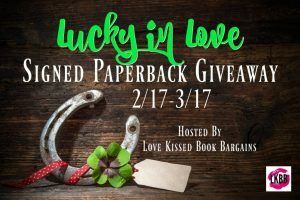 If you subscribe to my Youtube channel, you’ll get notified of new uploads, including excerpts, audiobook outtakes, and more! Erin deWard, Noah Michael Levine and I will be conducting an audiobook workshop for the Contemporary Romance special interest chapter of the RWA on Sat at 6 pm est. RWA members are welcome. More details will be available on my Facebook page soon. I’ll be conducting an audiobook workshop at the Sewickley Library, Sewickley, PA on April 22 at 10 am for the Three Rivers Romance Writers – the Pittsburgh area RWA chapter. 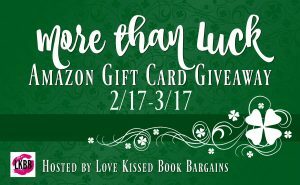 $1620 in Amazon Gift Cards are up for grabs in the More than Luck Giveaway offered by 81 romance authors.